At approximately 11:22 a.m. police received multiple 911 calls reporting a vehicle collision into a house at 315 State Rd. An investigation determined a pickup truck driven by Simon Quero-Luna of Gardner, Massachusetts veered off the road and collided with the house, according to police. 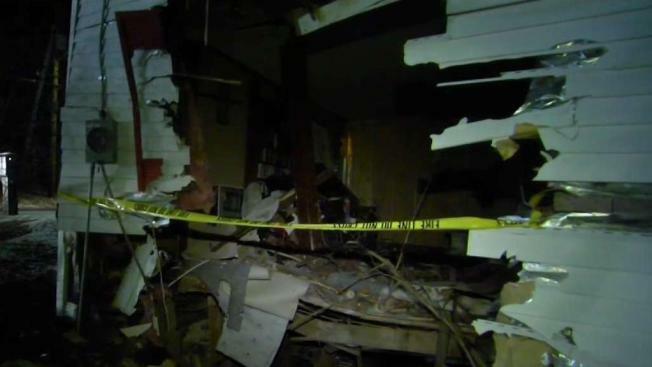 A Massachusetts woman napping on a couch was awoken by a pickup truck that crashed into her house and just missed hitting her by inches on Thursday, according to Templeton police. "Thank God I have my guardian angels watching over me," said Tracy Samuels, the woman on the couch. At approximately 11:22 a.m., police received multiple 911 calls reporting a vehicle collision into a house at 315 State Rd. An investigation determined a pickup truck driven by Simon Quero-Luna of Gardner, Massachusetts, veered off the road and collided with the house, according to police. "I got up and I went, 'Oh my God, what in the world is going on?'" Samuels said. "I turned and I looked and I went 'why is there a pickup truck in my living room?'" The truck traveled through the entire length of the house and collided with a parked vehicle in the driveway on the opposite side of the house before the truck came to a stop. Samuels said Quero-Luna got out of the truck and started running around. "He turned around and he saw me and went, 'Oh my God, are you OK?' and I said, 'Yeah, I'm fine, are you OK?” she recounted. Miraculously, nobody was injured, but the house sustained major structural damage and was condemned by the Templeton building inspector. The incident is being investigated by Templeton police.